In 1998 and 1999 Mander Organs worked on two organs which were largely the product of the firm of Gray & Davison. Their construction was separated by 14 years, and it was remarkable how much the organ building techniques changed in that short time. Both projects received funding from the Heritage Lottery Fund. St Katherine's Regents Park, London, was originally a Samuel Green organ built in 1778, which was thoroughly rebuilt in 1886 by Gray & Davison, retaining only the case and most of the pipework. At that time the internal frame, mechanism and console were all new and in addition new reeds replaced all of the Green reeds. There were also some new flue stops and the mixtures were re-arranged. Since then it has remained largely untouched, until in the period 1950-72, an extended Bourdon rank was added and various other alterations took place. By 1998 the organ was in a very poor condition. Mander Organs undertook a thorough renovation, removing the unsympathetic alterations of the 1950s to 70s, and where necessary replacing them with new components in the style of Gray & Davison. Considerable research was undertaken to ensure that such work was authentic. The extended Pedal Bourdon was removed, making access to the lower parts of the organ easier. A new parallel and concave pedal board was constructed based on that at the organ at St Anne's, Limehouse, which was originally built for the Great Exhibition of 1851. The lever that operated the feeders to the main reservoirs had been removed and a replacement has now been installed. Fortunately, the feeder bellows remained in place and only required to be releathered. A new hitch down swell mechanism was constructed, evidence for which was found within the organ. Further details for this were established from a small, two manual organ, at Stapleford Abbots which still has its original hitch down mechanism. Some of the Green front pipes required repairs before they could all be re-gilded and thus the appearance of the case could be enhanced. All of the work done to the organ was of a conservative nature, seeking only to correct the defects which usually afflict organs of this age, but it will enable this fine organ to continue to serve the congregation for another century. In line with the desires in the latter half of the nineteenth century for more aids to registration, a new set of composition pedals was included in the 1886 rebuild. The combination of stops affected by the pedals is adjustable (with the aid of a screwdriver!). Throughout the organ metal squares set in mahogany brackets are used. These were clearly a consequence of the industrialisation of the organbuilding workshop. The pedal action is pneumatic as was usual at this time but with one interesting variation. Below the Pedal Open Diapason 16' soundboard is what has aptly been described as a "pneumatic rollerboard". The tubes run in an orderly group, from the console, to the back of the organ, where they are connected to a long and shallow box which is shaped like a rollerboard, inside which are the lead tubes. In other respects the organ building techniques used were not very different from those of the Eighteenth Century. Iron rollers had replaced wood but the rollerboards were still framed up. The soundboards were laid out diatonically with basses on the outside ends thus necessitating having a roller for every note. 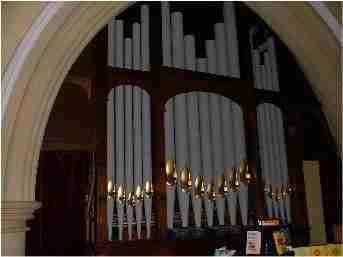 The organ of Peartree Parish Church, near Southampton, was quite a different proposition. 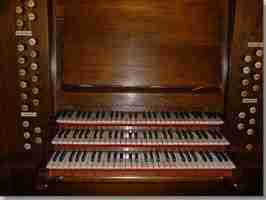 In 1900 Gray & Davison built a new two manual organ, with a prepared-for third manual. Within five years the third manual had been inserted but by Burton of Winchester, not by G&D! At this point the action became pneumatic throughout. The choir organ was provided with pipework which was in keeping with the original intentions but not including the Harmonic Piccolo, although there was space left for the slide. The resources of the pedal were increased by the local firm of Ivimey & Cooper in 1950. More work was carried out in the 1970s. In 1998 Mander Organs began the task of bringing the organ into line with Gray and Davison's 1900 specification, including new mechanical key, drawstop and composition actions. In addition, a new console had to be constructed using oak and reclaimed pitch pine. Although the original pedal touchbox survived, it had been drastically reconstructed to operate a newer tubular pneumatic action, by which the stop changes were no longer effected by slides. A new pedal stop action had to be created with pneumatic motors operating the slides to the touchbox. A completely new Choir soundboard was built to match the Great and Swell. The Harmonic Piccolo 2' which was included in the 1900 specification, and had been prepared for since 1905, finally got installed! The scales for this stop were taken from the Gray & Davison organ at Clumber Park Chapel in Nottinghamshire, which is now in the care of the National Trust. 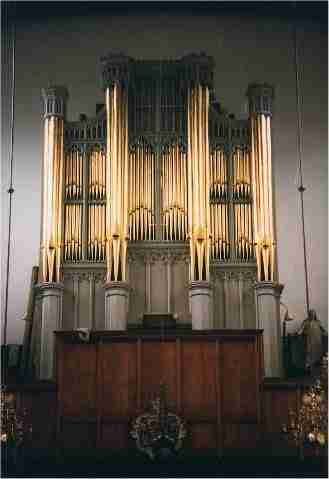 As they are now, the manual departments of the organ match the original Gray & Davison scheme, except for Swell Double Diapason 16' which was retained from the 1950 rebuild. The Pedal division was kept in its 1950 form, except for the revoicing of the Tuba as a Trombone 16' which balances better and is stylistically more in keeping with the period in which the organ was built. St Katherine's, Regents Park, provided useful indications as to how the composition action could be constructed, but it was not until a visit to a small organ at Stapleford Abbots (1901) that a clearer picture emerged of G & D contemporary practice. By then dramatic changes had occurred. Iron trundles had taken the place of the timber vanes in the composition action, but it was the key action which showed the greatest changes. In place of the extensive rollerboards seen at St Katherine's were very small rollerboards, which serve to transfer the bottom nine alternate notes from C#2 to the treble end of the keyboards. The trackers are then splayed from the keys to the soundboards, which are laid out diatonically for the bottom 18 notes and then chromatic from f#19 upwards.